So far we’ve only been dealing with 2D objects, we’ve also had a look at shaders. But we’ve only done stuff in two dimensions, now it’s time to make the step into the 3D world. In order to do this, there is a few things we need to do. The main thing is moving the object to the correct “space”. The spaces are an important, yet confusing, part of 3D rendering. Think of them as a separate coordinate system or a separate world. Any object has a coordinate in all of the spaces. So basically, this is the coordinate that describe how the model looks. Let’s look at the cube again. It needs to have a position that says where it is in the game world, so that it will appear in one specific spot. If you’ve ever used a map editing program, you can see the exact position of every object. This is the world space coordinates. When programming the gameplay elements like collision detection, this is the coordinate system we’ll be using. The idea behind it, is that every obejct has their own position in the world space, and that position is the same no matter how you look at it. This is an example of a world space that has a cube close to the center and a player to the left of it. The example is for 2D worlds for simplicity, but it would be exactly the same in 3D, only with an extra dimension. Whereas the world space location is universal and the same for everyone, the view/camera space is different. It basically tells where the objects are in relation to the player where the player is looking. It is similar to pointing a camera at an object. The center of the image would have the position [0, 0, 0] and every other coordinate is defined around that. These are known as camera or view space coordinates. Compare the previous image with this. In the previous image, the cube ( [-1, -1] ) is to the left and behind the player ( [-2, 0] ). So if you look at it the world space from above, that’s how it looks. But if you look at it from the view space of the player, the player will be in the center, and the cube ( which is still at ( [-1, -1] in world space ) will be to the right. Note that the object hasn’t moved around in the world and the player hasn’t moved either. All we did was looking at it with the player as the center instead of the center of the world as the center. Another thing about the camera space is that it’s going to be relative to the direction the player or camera is facing. So imagine the player is looking along the x-axis ( towards the world space center. ) Then the player starts rotating right. Soon he’ll see the object. Since he’s rotating right, he’ll see the object moving to his left. Now imagine him stopping. What he can see, is the world in his own view space. Another player at another location looking at another point would see the world in his own view space. This might be a bit confusing, but it’ll get clearer soon. Finally we have the projection space. This is a little different, it describes the final position on the screen the vertex will have. Unlike the other spaces, this is always a 2D coordinate, because the screen is a 2D surface. You can look at this like the lens of the camera. The camera looks at a 3D world and the lens enables it to create a 2D image. You can look at it like the 2d version of the view space. When the camera looks at an object, it sees the view space. But what ends up on the screen is in 2d, and that is what we refer to as the projection space. The big pyramid is the view space. It’s all that we can see. In this case it’s just three cubes. The 2d plane with the 3 cubes represented in 2d is the projection space. As you can see, it’s the exact same as the rest of the view space, only in 2d. This is what’s called an identity matrix. You can look at it like like a skeleton or an “empty” matrix. It won’t change the object at all. So when we intialize a matrix, this is what we initialize it to. If we had initialized it to just 0 for all values, it would have changed the object. We’ll look into the math involved for matrices in the next part. For now just remember than an idenity matrix is a default matrix that doesn’t change the object it’s used on. Instead we’ll look at how to work with matrices. And for that purpose, we use glm. In order to do graphics programming, we will eventually need to do more mathematics stuff involving vectors and matrices. We really don’t want to do this manually, because there is lots of operations we’d have to implement ourselves. Instead, we’ll use a tried and tested library that does the mathematics operatiofor us. 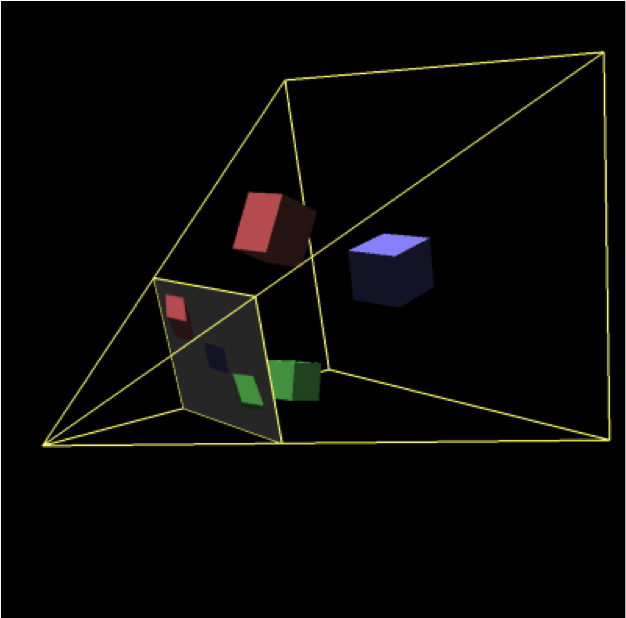 glm, or OpenGL Mathematics, is a library made for doing the maths for graphics programming. It’s widely used and does just about everything we need. It is also 100% platform independent so we can use it on Linux, Windows and Mac. The libraries we have been dealing with up until now has required both header files, and library files. glm however, only requires header files. This makes installation very easy, even on Windows. Both Linux and Mac might have glm available from package manager. If that’s the case, the process is the same as for SDL. Just open the terminal and install glm just like you would with any other program or package. If the package is not found, we need to “install” it ourselves. If you’re on Windows ( or Linux / Mac and the first step didn’t work, ) we need to install the library ourselves. Fortunately this is relatively easy. The first step is to download glm. You can do that here.. Scroll to the bottom and download the format you want ( .zip or .7. ) If you have a tool for dealing with package files, you should have to problems extracting it. Windows has built in support for .zip so choose this if you’re unsure. If none of the options work you can install winrar or 7zip. Take the folder name glm ( the one containing the .hpp files ) and copy it to /usr/include/ so that you end up with a folder called /usr/include/glm/ that contains all the glm header files. Since this is a system directory, you won’t be able to put them here the regular way. But there is a few options. sudo is short for “Super User DO”. This is needed because it’s a system folder. sudo basically tells the operating system that “I know what I’m doing” Use it with caution! The cp is the terminal command for copying. In order to make sure you got it right, run the command sudo ls /usr/include/glm it should now list the .hpp folders just like in the folder we looked at earlier. We can now include them in the same way as the SDL2 header files : #include <glm/vec4.hpp>. And since glm only uses header files, we don’t need to change our compile command! Using the OpenGL Matmetics library ( glm ) is quite easy. There’s just a few simple functions we need to do what we want. First of all, it’s just a mathematics library, so there’s no initialization code. That means we can jump straight to the mathematical functions. Fundamentally, vertecies and matricies are very simple constructions in glm. They’re just arrays with one element for each value. So a 3d vector has 3 elements, a 4d vector has 4 and so on. And similar for matrices. A 3×3 matrix has a 9 element matrix. It’s arranged in a 2d array like so : float matr33 and similarly a 4×4 matrix has 16 values and can look like this : float matr4. glm uses float types instead of double but this can be changed if you want to. Both of these produce a idenity matrix, which you can look at as a default value for matricies. It can also be used for reseting a matrix. In addition to identity matrix, we’ll be looking at translation matrices . A translation matrix is used to move an object by a certain amount. Remember above when talking about world space we saw that each object needs its own position in the world space? This is what the translation matrix is for. We use it to move a single object to the position it’ll have in the world space. Every object in your game world needs to have a be moved to a position in the world space, and to move it we use a translation matrix. In addition to translating ( or moving ) an object, we can also scale and rotate it. All of these operations that works on a single object is called the model matrix. We’ll be using the name model matrix, but wel’ll be looking at rotating and scaling in a later post. If you specify the vector [ 0, 0, 0 ] you’ll end up with a matrix that doesn’t translate the object at all. Nor does it change it in any way. So in effect you’ll end up with just a identity matrix. So how do we use it? Well that’s a bit more complicated so we’ll look at this later in the post. Now that we’ve placed the object in world space, we need to place it in the camera/view space. This is a bit more tricky because we need to set both position and where the camera is pointing. Think of it as how the camera itself is rotated. For instance, the camera could be turned up and down. Or tilted to the side. Doing so, would also change how the coordinate systems work Which is logical. If you turn the camera upside down, positive x would be towards the left and negative towards the right! A possible use for this is if the player is hanging upside down. Then you could just change the up vector, which would rotate everything the player sees. The view matrix dictates the position and orientation of the game camera ( what will end up on screen. ) But there is another matrix we need in order to do 3d, the projection matrix. float const &aspect – same as screen formats ( 16:9, 16:10, 3:4, etc… ) Changing this will stretch the image. float const ≠ar – the closest to camera something can be. Anything closer will be cut off. float const &far – the furthest away something can be. Anything further away will be cut off. The fov paramater is said to be spcified in degrees, and that’s what we’ll use. But it seems some have issues with glm wanting radians instead. Radians is just an alternative to degrees. You can read more about it here.. So if it doesn’t work, you can try specifying 3.14 * 0.25 = 0.785 for 45º. Tip : if you own Minecraft you can experiment with this by going to options and changing the fov there! So, even though there are a few parameters here, they are relatively easy to comprehend. We’ll look more into how the actual matrix looks and what different types of projection matrices we can make ( yes, there are others ) in a later post. We can combine all the matrices into one, so that we only have to multiply each of the vertexes by one matrix instead of all three. But when doing matrix operations it’s important to notice that the operations are not commutative. That means that the order in which you multiply them matters. This is in some cases very useful, but it can also lead to weird behavior. In general, the order is left to right. The thing you want to happen first, should be the first part of your multiplication chain. Let’s assume we have three matrices. One for moving, one for scaling and one for rotating. If you wanted to scale, then rotate, then move, you’d do mat = scale * rotate * move. But… When it comes to the transitioning between spaces, it’s opposite! So we start out with the projection, then we multiply by view and then by model. I won’t go into the details of why ( would take too long time ) but it’s important to remember this for later. Now that we know the basics of the matricies, we can finally have a look at how to use them in order to move objects, do projection and get something 3d on the screen. In order to do this, we must pass our matrix on to the shader. And this is where the benefit of having just one comes in. We can now just send one matrix for each object we are rendering, which means we have to send less to the GPU and the rendering will be faster. Unifroms are global variables within the shader. It is a constant value so it does not change from rendering call to rendering call. You can’t actually change it from inside your shader at all. Doing so would cause a compiliation error. This is very practical because if there is an issue due to a uniform, we know it’s being changed somewhere in our main source code. Quite simple, and now the matrix is set and we can ( finally ) render 3d! So now after all that work, let’s see what we ended up with…. Remember from my previous part where I talked about the last step of the rendering piepline, per-sample operations? * I mentioned the depth test and how it determines if something is obscured / invisible and should not be rendered. What you see above is the consequence of not enabling the depth test. This is the front side of the cube. So far it all looks good! Here’s the back and the bottom, and here’s where it goes wrong. The front should cover the bottom. But here the bottom is covering the front. This is because we don’t have depth test enabled so OpenGL just draws the bottom on top of it. Here we’ve added the the next side. If you compare with the inital part, this is what gets covered up. But why just this? Here we’ve added half of the front. From this we can see that it is covering the bottom and right sides. It covers up everything. This is because it’s the last thing we drew, so it gets drawn last, on top of everything. … we end up with what we saw earlier. The back gets drawn and covers everything. Then the top and left sides gets drawn on top of that. .. we see that it actually IS a 3D object! Finally! So how does all of this work? It’s quite simple. You can tell OpenGL to create a buffer ( think of it as a 2d array ) that has one value per pixel that says something about how far that pixel is from the camera. Each time you draw something, OpenGL checks the value for that pixel in the array. This way, OpenGL can determine if what you’re trying to draw is closer to the camera than what’s already there. If it is, then the new pixel will be draw instead of the old one and the distance value in the buffer will be updated with the value of the new pixel. That way this buffer will always keep a buffer that contains the value of the information about the closest pixel that has been checked so far. Here’s how it worked when we drew the front ( blue ) over the rest. For every pixel it compares the previous value ( left ) value with the current ( right ) value. In this case, the blue one is closer and is drawn over the yellow. This happens for every single pixel we try to draw. Luckily, OpenGL is pretty quick at this. GLenum cap – the OpenGL capability we want to enable. In our case its’s GL_DEPTH_TEST. This basic function is used for turning OpenGL features on. You can see a full list of the possible values here. Here we tell OpenGL what function to use for depth testing. We will be using GL_LEQUAL, you can find more information about it and the others here. The | character is a way of combining the two values so that we clear GL_DEPTH_BUFFER_BIT and GL_COLOR_BUFFER_BIT in one call. A class that keeps track of Shaders. This is a class I wrote some time for keeping track of SDL events like quit, button presses, mouse move, mouse position, etc… It is not dirctly related to OpenGL, we just use it to make our interaction with SDL a tiny bit easier. A very simple Math helper class. It simply takes an EventHandler and creates a vec3 of the movement based on the arrow keys and w and s. So if you you press left, it’ll create a vector with a negative x value. This means that when we use glm::translate with the vector as the argument, we’ll get a matrix that moves the object left. It’ll be the same for every direction. Pressing w will move the object closer, s will move it away “into the screen”. As you can see, main.cpp doesn’t do anything to OpenGL. In fact, it doesn’t even include any OpenGL or SDL stuff. This is completely intentional. main.cpp should only control stuff. Since the code is quite long and too big to put in this post ( unless you really like scrolling! ) I’ve put it in the Github repo for this code. I’ve also created a zip file in case you don’t want to deal with git. You can find it here. And NOW we’ve covered everything we need to know in order to do basic 3d rendering. It has taken me a long time to write all of this and it is quite long. But I hope you enjoyed it and that it helps you understand 3d rendering. If not, feel free to ask, I’m happy to help if I can.